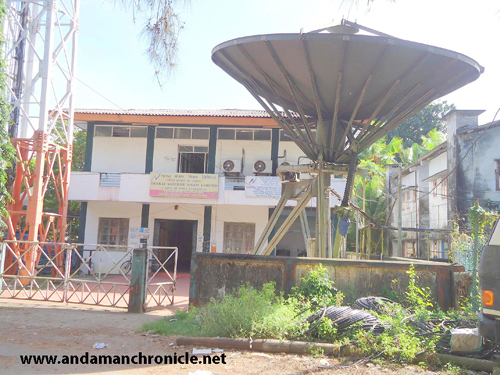 Car Nicobar, Aug. 26: Even after reports published about the Poor Telecom Services recently in the leading local daily Newspaper and National Broadcasting media, the Telecom Company BSNL continues to remain unaffected and insensitive. The Telecommunication Services are still in bad shape and poor tribal community is left on its fate. Rather the situation has worsened in the last few days. Villagers want to talk to their children, studying at Port Blair or in main land, but unable to do so. A resident of Tamaloo village Mr. Anthony told that his son, who is studying in main land, is not keeping well for the last many days, but Anthony is helpless and worried, as he is unable to talk to his ailing son, due to the failure of the mobile network services. The people of the far-off villages told that many times they are not able to make emergency calls to take serious Patient to the BJR hospital for treatment, due to network failure. In Chowra, Teressa and Katchal too, the BSNL services are kept paralyzed. People living there find themselves in absolute isolation from the outer world. The Chief Captain of Katchal Shri Michel Yok in his written complaint to the Member of Parliament, Shri Bishnu Pada Ray explained about the hardship being faced by the People of his Island. He said that barring the headquarter areas, the other villages are almost out of the Network Coverage area. A local resident Shri Sakki Kumar said that this is very unfortunate that the worst affected Island by the Tsunami, remains neglected by the BSNL. The new Lt. Governor was expected to come to Car Nicobar for a brief stay, on the way to his return journey from Campbell on last Sunday. People expected that the VIP visit would put some impact, so far as telecom services are concerned, but it left them disappointed. The condition remains the same after the high profile visit of the LG. Network is unavailable even in the headquarter area. The local unit of the BSNL seems to be helpless. The unit has not been given adequate staff since its installation. It is learnt that there are only two regular staffs posted to the Carnic Unit of BSNL. The shortage of man-power has been one of the main reasons for this failure as the limited number of staff is not able to carry out the maintenance work of the towers located at different villages. Many of the towers have failed years back, and no repair has been done so far. During his last visit to this Island this month, the Member of Parliament Shri Bishnu Pada Ray too saw the pathetic condition of BSNL Network. In most of the villages where he visited, he found that either Network is unavailable or is ineffective. Expressing concerns, he told that the region comes under the perimeter of disaster prone area and instead of providing the best Telecom services to this region, people are deprived of it. The 2nd Captain of the Arong village Shri Sunny James had suggested while talking to MP that other Telecomm Companies should also be allowed to operate in these remote southern group of Islands, so that better facilities might be extended to the people.